Want to explore the magic of East Bali with your little tribe? We’ve got just what you need! Enjoy the comfort of a luxury villa with a private infinity pool, a ton of family activities, Spa pampering for the grown-ups, live music and dining. The perfect family escape! This just might be the “screen free” quality time you’ve been craving. Not that you won’t have access to great Wi-Fi in your villa, but you’re going to be way too busy to text, game or spend precious time on social media! Start your day with gazing at the stunning sunrise over Lombok Island, then come to enjoy breakfast all together before we shuttle you to your choice of activities for the day: snorkeling, white water rafting, hiking, swimming, paddle boarding, mountain biking or even scuba diving (*)! The hardest part will be to choose! PS: OK let’s to reassure you: after the day's adventures are done, you can of course take advantage of your free internet access to share your coolest #shotsoftheday with your best friends at home! (**) Daily Breakfast, Lunch and Dinner + Dinner on the first night + Breakfast on the last day. Each meal is to be chosen from our Kid’s Menu and includes 1 Fresh Juice or Soft Drink. Kids age is up to 12 y.o. 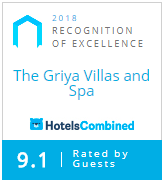 © 2019 The Griya Villas and Spa. All Rights Reserved.